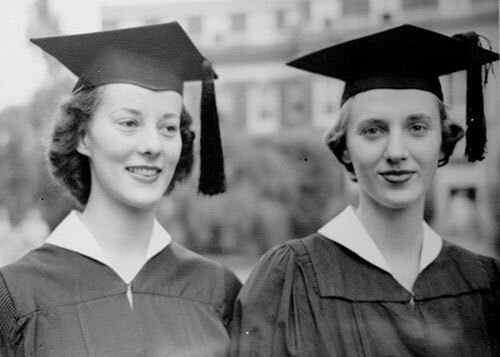 Ann Robbins, on left, and Nancy Byrd at their college graduation in 1954. “We knew each other before we knew our husbands,” Nancy Byrd said of her friend, Ann Robbins. 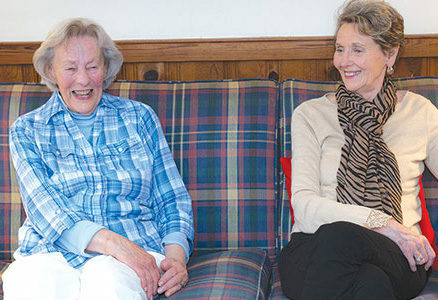 “So it’s funny that Nancy married a Byrd and I married a Robbins,” Ann said, pointing out the avian connection to their married names. But their strikingly related surnames are not the only thing the two women have in common. Both were born and raised in North Carolina, Robbins in Burlington and Byrd near Boone. Their paths first crossed in 1950 during their freshman year of college at what was then the Woman’s College of the University of North Carolina, now University of North Carolina Greensboro. “We had some classes together freshman year,” Robbins explained. “People were always mixing us up.” This was despite the women bearing no obvious physical resemblance to each other and dressing in decidedly different fashions. They became fast friends, assigned to sit beside each other as second sopranos in their chorus class. “Since we were mixed up so often and we had to check in to class with our student numbers, we realized we could each use the other’s number and one of us could have the day off,” Byrd said. She would walk into class and check in with her number, then get back in line and walk back in, offering Robbins’s number. No one was ever the wiser. When they graduated college in 1954, both with degrees in primary education, they interviewed at Woodlawn Elementary School in Hopewell on the same day. Both were hired, Byrd to teach first grade and Robbins to teach second. The plan didn’t last long, though. “They threw me out in December,” Robbins said. Byrd added, “At that time, you could only teach until your fifth month of pregnancy.” Robbins was “really upset to have to quit,” and Byrd wasn’t far behind. Also pregnant, she had to stop teaching in March. After their short stint together at Woodlawn, it seemed their paths were taking two different directions. For a while, due to their husbands’ jobs, they lived several states away from each other. During this time, Robbins and her husband, John, rented an apartment in Hopewell. Although Robbins missed Byrd, she often got word of her friend from her husband, Davis, who visited regularly when he was in Hopewell for business. “One visit, he told me there was a slim chance they’d be back. I about jumped out of my chair!” Robbins said. In 1965, the Byrd family returned to Virginia. By that time, Robbins and her budding family had settled in Enon. “I had one weekend to buy a house,” Byrd said. 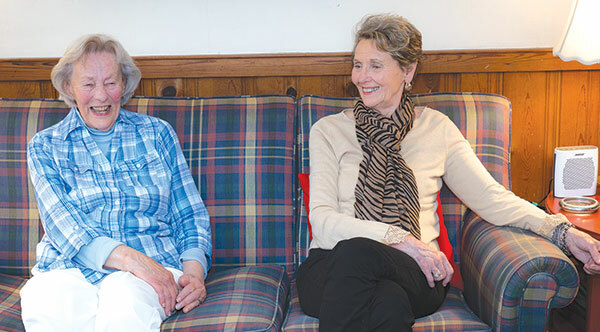 “Ann said, ‘they’re building a house two doors down from us,’ and that was what we took.” The two friends have lived two doors down from each other ever since. When Robbins injured her back while carrying one of children over a sandy beach, her doctor ordered her to rest in bed for three days. “I nearly lost my mind,” Robbins said of the experience. When they were both teaching second grade at Enon Elementary School, their walks helped them keep their sanity. “It helped to be able to do some adult talking,” Byrd said. Robbins began teaching at Enon in 1963, with Byrd joining her in 1966. Both women taught second grade in classrooms next door to each other. While out for their morning walks, the women pick up trash and enjoy looking for the first signs of spring — blooming redbud trees, daffodils. “And we always look for bluebirds,” Robbins said.